Don't get stuck without either of your tracking or training devices while on the hunt. 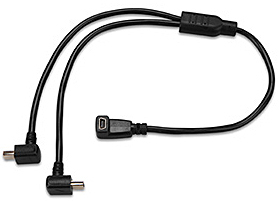 Our split adapter cable allows you to recharge your Alpha and TT 10 devices in your vehicle at the same time. Or, you can use it to charge 2 devices (Alpha 100 and/or TT 10) from a single cigarette lighter receptacle or single AC adapter. 010-01041-00 Alpha 100 Bundle No Longer Available. 010-01041-40 TT 10 No Longer Available.